Steve Ross, University of North Carolina Wilmington Research Professor, was honored with a Partners in Conservation Award from the U.S. Department of the Interior. The awards recognize conservation achievements that highlight cooperation among diverse federal, state and local governments; public and private entities; non-profit organizations and individuals. Ross was part of one of two science teams that were honored for conducting ocean research sponsored by the Bureau of Ocean Energy Management (BOEM). He is the co-leader of the Atlantic Deepwater Canyons project which was the subject of the award, and the project took place mostly in Baltimore and Norfolk canyons and near-by waters. 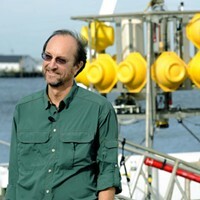 The research involved collaboration with about two-dozen federal, academic and private sector partners (including international partners) over the past four years through the bureau's Environmental Studies Program, with both projects leveraging the National Oceanographic Partnership Program, or NOPP, framework. Using sophisticated Remote Operated Vehicles (ROVs), the team of researchers discovered perhaps the world's largest methane cold seep. The new seep discovery is only the third documented seep site on the U.S. Atlantic Coast, and by far the most extensive; the two seep areas at this site are estimated to be at least a kilometer long and in places hundreds of meters across. The seep discovery could potentially play an important role in advancing scientific understanding of hydrocarbon resources and gas hydrates (important possible future energy resources) along the US continental slope. In addition, this team documented the first records for the area of some deep-sea corals and observed many unusual habitats and associated animals. "Such diverse partnerships are difficult to manage, but the pay-offs in high quality science and synergistic collaborations provide lasting benefits," notes Ross. "These canyons are important fish habitats and are extremely productive; our research suggest they should be protected." The Partners in Conservation Awards ceremony was held at the Department of the Interior headquarters on January 16, 2014. Sally Jewell, Secretary of the Interior, presented the awards to 20 public-private partnerships for their conservation results and community engagement. Details about each partnership and the organizations involved can be found here.